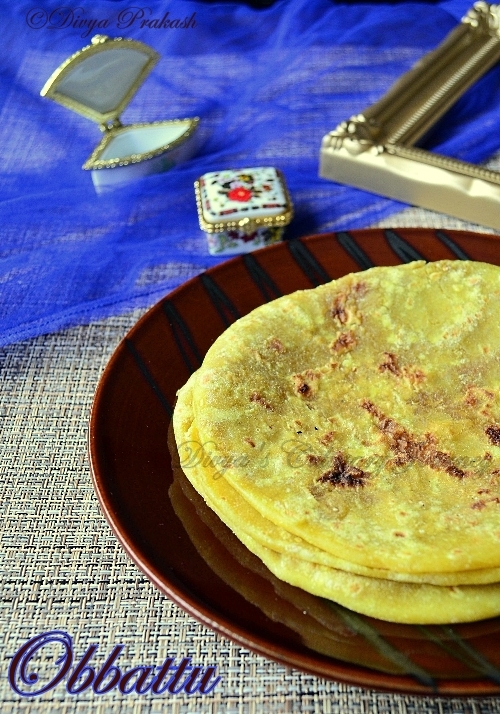 Today's recipe is Poli / Obbattu. This is for the 3rd day of blogging marathon under the theme, stuffed breads. Better late than never, I am posting almost 4 days late. I was in the midst of many things in the family, I hardly could find time to blog, blog hop or do anything related to blog. Also my laptop is not co-operating, it is counting its days now. But somehow, finally managed to post today. In a bowl, combine the flour, salt, turmeric powder and knead adding water little by little into a soft dough. It will be sticky. Now add oil and knead for a minute or two and let it rest for at least an hour. The more resting time, the better. Cook channa dhal in pressure cooker. Drain excess water and grind the dhal into a coarse mixture. In a pan, melt the jaggery, filter and add to ground channa dhal and mix well. Cook this mixture, stirring regularly until it thickens. Then add grated coconut, cardamom powder and switch off the flame and let it cool. Once cooled, roll them into small balls. Now divide the dough and roll them into equal sized balls. With the rolling pin, roll the dough to small discs, place the dhal stuffing ball and cover it by bringing all the edges together and seal the edges and flatten slightly. Repeat the same for all the dough balls. Roll the prepared balls into poli, dusting flour as needed. Heat the griddle, cook poli on both the sides drizzling ghee as required. You can also use toor dhal in the stuffing. If using toor dhal, use both the dhals in the 50:50 ratio. The thickness of the poli depends on your preference. Poli tastes best when eaten warm. 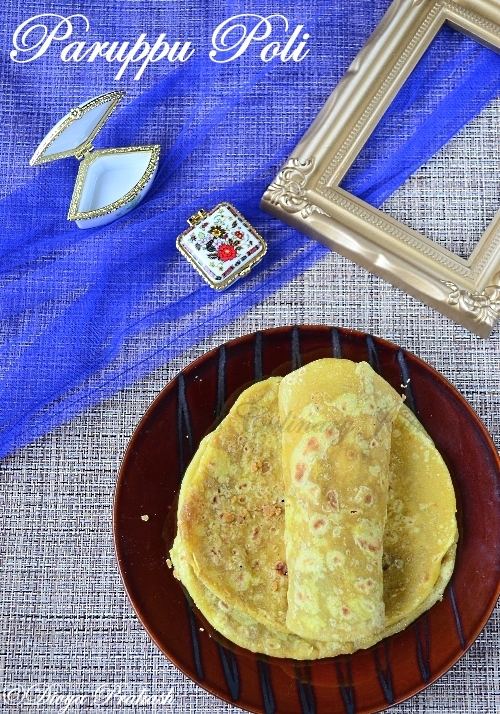 Love puran poli..nevere made them...These look so yummy dear..
parippu poli looks delicious. I love it. 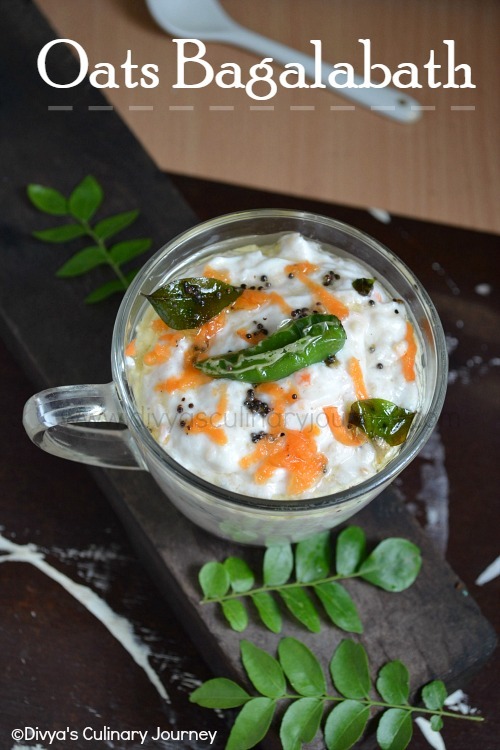 Paruppu poli looks so yummy. Never get fed of this delicious poli. Delicious, one of my favorites..
My favorite sweet. So yummy dear. my long waited to do recipe.you done it so well. So perfectly done and clicked! Yummy! Mouth watering puran poli..loved it. 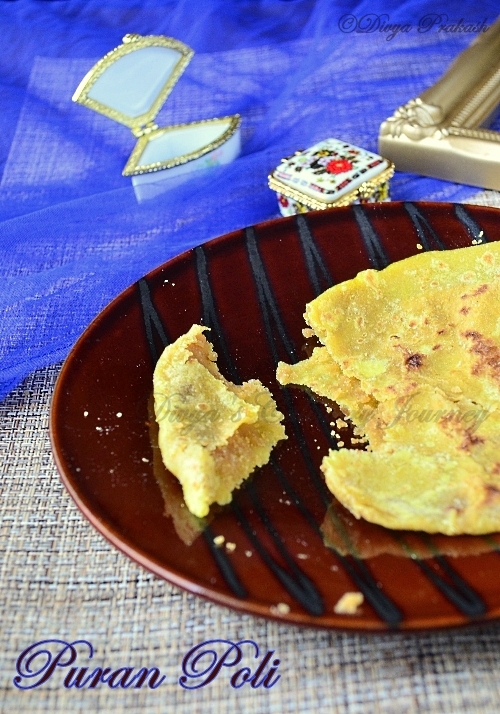 Puran Poli is my fav too...looks so soft n delicious...loved it color, looks very tempting dear! Soft and perfectly made,looks divine. Looks tempting n perfect n mouthwatering. one of fav traditonal sweet.tastes best vth ghee when its hot....can feel d taste r8 nw.its just awesum..
Dont kill me like this..Believe me, my mouth is just watering here, irresistible polis. 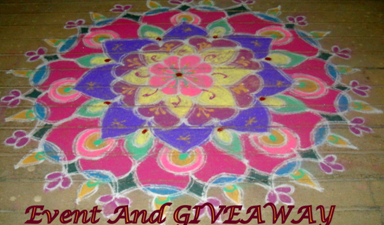 my fav one...looks tempting dear!! my all time fav, love to hv nxt day with mashed banana :-)wow ur poli tempts me, mouthwatering!!! the gorgeous blue scarf really makes the poli pop out of the screen - truly great clicks!! !